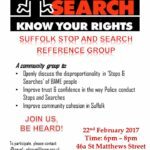 The reference group brings together members of Suffolk’s Black, Asian and Minority Ethnic community and the Suffolk Constabulary to discuss incidents of disproportional use of Police stop and search powers and the resultant effect on community cohesion. The Stop and Search Reference Group was one of recommendations from the ISCRE’s research conducted to unpick the issues contributing to the paradox that sees more Black and Minority Ethnic people being stopped and searched than white people in Ipswich. The reference group is chaired by a member of the BME community and it is made up of other interested members of the community, ISCRE, Suffolk Police Authority member(s), Independent Advisory Group (IAG) member(s) and Suffolk Constabulary: Area commander(s) / representative, Diversity Manager/Diversity Officer, Black Police Association (BPA) representative and Officers/Supervisors from different areas of Suffolk. The reference group meetings are held bi- monthly in different parts of Suffolk at 46a St Matthews Street, Ipswich, IP1 3EP. Subscribe to our Stop and Search Newsletter for the latest information.